Codethecity is a civic hacking initiative interested in hack weekends, open data, workshops, and idea generation tools. So, how did CTC6 – The History Jam go? 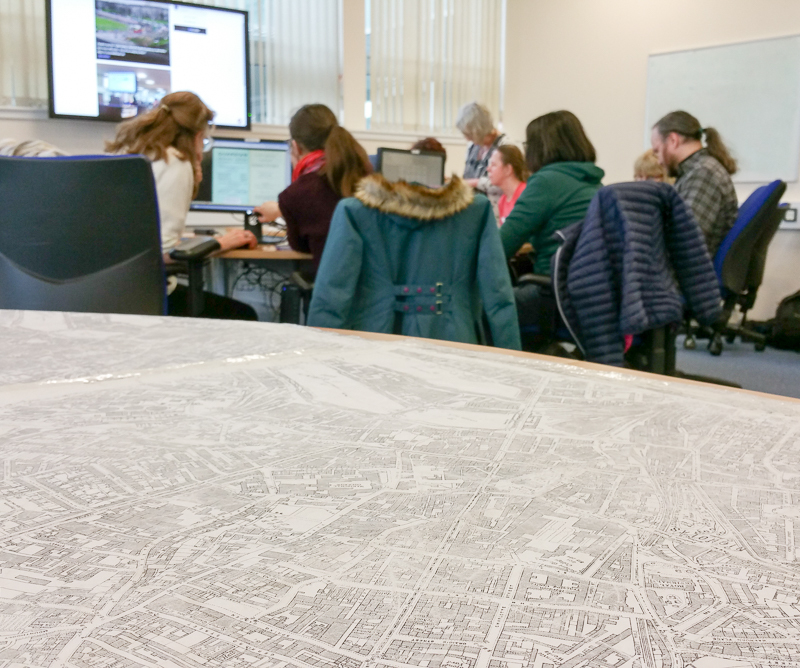 On 19th and 20th March we found ourselves back at Aberdeen Uni with 35 or so eager hackers looking to bring to life a 3D Virtual Reality historic model of Aberdeen city centre using new open data. So how did it go? This time we were more prescriptive than at any previous Code The City event. In the run up to the weekend we’d identified several sub-team roles. Integrating and visualising the new data in the model. After some breakfast, an intro and a quick tutorial on Open Data, delivered by Andrew Sage, we got stuck in to the work in teams. We were lucky to have a bunch (or should be a shelf-ful) of city librarians, an archivist and a gaggle of other volunteers working on sourcing and transcribing data into some templates we’d set up in Google Sheets. Given that we’d been given scanned photos of all the shop frontages of Union Street, starting in 1937, of which more below, we settled on that as the main period to work from. 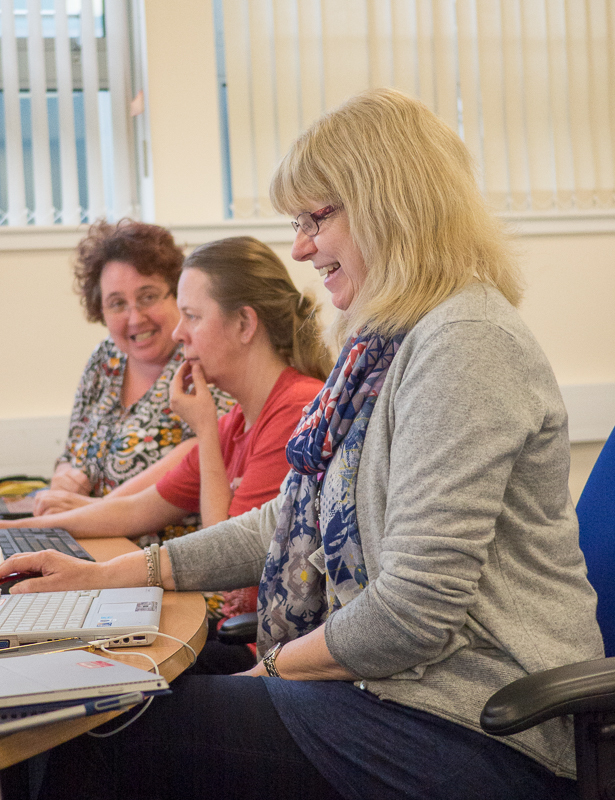 The librarians and helpers quickly got stuck into transcribing the records they’d identified – particularly the 1937-38 Post Office Directory of Aberdeen. If my arithmetic is correct they completely captured the details of 1100+ business in the area around Union Street. At present these are sitting in a Google Spreadsheet – and we will be working out with the librarians how we present this as well structured, licensed Open Data. It is also a work in progress. So there are decisions to be made – do we complete the transcription of the whole of Aberdeen – or do we move onto another year? e.g. 1953 which is when we have the next set of shopfront photos. At the same time as this transcription was ongoing, we had someone sourcing and capturing music such might have been around in 1937, and sounds that you might have heard on the street – including various tram sounds – which could be imported into the model. And three of us did some work on beginning an open list of gigs for Aberdeen since the city had both the Capitol Theatre (Queen, AC/DC, Hawkwind) and the Music Hall (Led Zeppelin, David Bowie, Elton John) on Union Street. This currently stands at 735 gigs and growing. Again, we need to figure out when to make it live and how. At CTC5 back in November 2015, Andrew Sage had started to build a 3D model of the city centre in Unity. That relied heavily on manually creating the buildings. Andrew’s idea for CTC6 was to use Open Streetmap data as a base for the model, and to use some scripting to pull the building’s footprints into the model. This proved to be more challenging than expected. Steven Milne has written a great post on his site. I suggest that you read that then come back to this article. As you’ve hopefully just read, Steve has identified the challenge of using Open Streetmap data for a project such as this: the data just isn’t complete enough or accurate enough to be the sole source of the data. While we could update data – and push it back to OSM, that isn’t necessarily the best use of time at a workshop such as this. There is an alternative to some of that. All 32 local authorities in Scotland maintain a gazetteer of all properties in their area. These are highly accurate, constantly-update, and have Unique Property Reference Numbers (UPRNs) and geo-ordinates for all buildings. This data (if it was open) would make projects such as this so much easier. While we would still need building shapes to be created in the 3D model, we would have accurate geo-location of all addresses, and so could tie the transcribed data to the 3d map very easily. We were given by the city’s Planning Service, scans of photos of shopfronts of Union Street from a number of decades from 1937, 1953 and on to the present. Generally the photos are very good but there are issues: we have seams between photos which run down the centre of buildings. We have binding tape showing through etc. A split building on Castle Street. These issues are not so very difficult to fix – but they do need someone with competence in Photoshop, some standard guidance, and workflow to follow. We started fixing some photos so that they could provide the textures for the building of Union Street in the model. But given the problems we were having with model, and a lack of dedicated Photoshop resource we parked this for now. Taking this project forward, while still posing some challenges, is far from impossible. We’ve shown that the data for the entire city centre for any year can be crowd-transcribed in just 36 hours. But there are some decisions to be made. Picking up on the points above, these can be broken down as follows. Creating volunteer transcribing teams, with guidance, supervision and perhaps a physical space to carry out the work. Set up a means for the general public to get involved – gamifying the transcription process, perhaps? Similar to the data above. Establish how best to display the transcribed data – and to allow someone in the 3D environment to move forward and back in time. Look at how we can reuse the data in other formats and platforms (such as Minecraft) with minimum rework. Speed up the 3D modelling by identifying funding streams that could be used to progress this more quickly. If you have suggestions please let us know as a comment below. As the model takes shape and we experiment with how we present the data we can hopefully get more attention and interest (and funding?) to support its development. It would be good to get some students on placements working on some aspects of this too. Aberdeen City Council is working with the Scottish Cities Alliance to replace and improve the Open Data platforms for all seven Scottish cities later this year – and that will provide a robust means of presenting and storing all this open data once in place but in the mean time we will need to find some temporary alternatives (perhaps on Github ) until we are ready. We welcome your input on this – how could you or your organisation help, what is your interest, how could you assist with taking this forward? Please leave comments below. Code The City 6 – The History Jam was funded by Aberdeen City Council’s Libraries service and generously supported by Eventifier who provided us with free use of their Social Media platform and its LiveWall for the sixth consecutive time!. 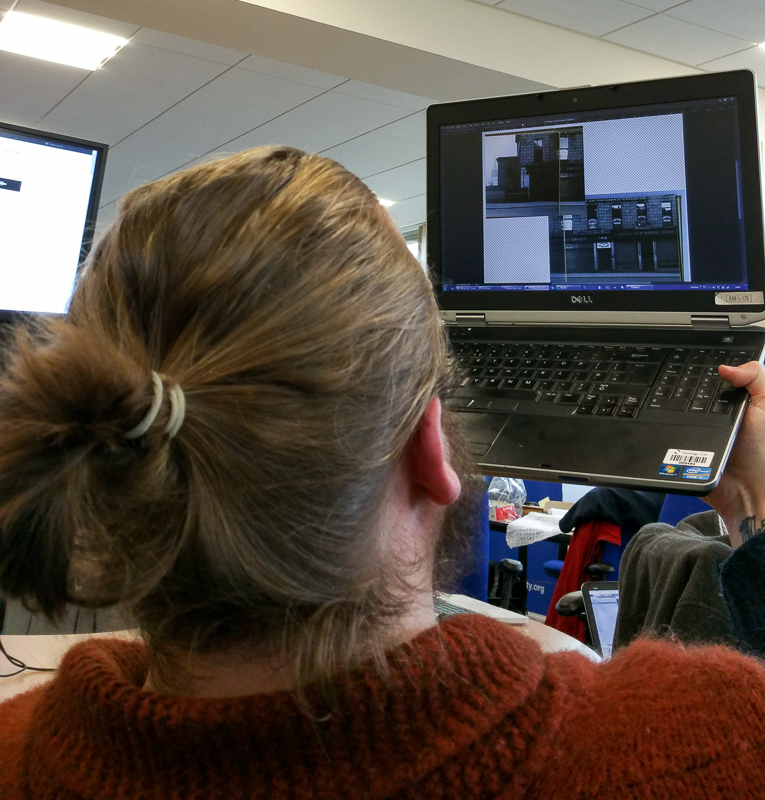 Posted on March 27, 2016 Author Steve MilneCategories hack weekend, open dataTags 3d, Aberdeen, ctc6, history, mapping, open data, virtual realityLeave a comment on So, how did CTC6 – The History Jam go? The History Jam (or Code The City #6 if you are counting) will take place on 19-20 March 2016 at Aberdeen University. You can get one of the remaining tickets here. As an participant, you’ll be bringing history to life, creating a 3D virtual reality map of a square mile of Aberdeen’s city centre. You’ll be gathering data from a variety of historical sources, transcribing that and creating new open data. You’ll import that into the the 3D model. And there will also be the opportunity to re-use that data in imaginative new ways. So, if you are a MineCraft fan, why not use the data to start building Minecraft Aberdeen. This is not one of our usual hacks, whatever that is! This time around instead of you proposing problems to be worked on, we’ve set the agenda, we’ll help form the teams, and provide you with more guidance and support. If you come along you’ll learn open data skills. And you’ll get a year’s free membership of the Open Data Institute! 09:00 Arrive in time for fruit juices, coffee, pastries, or a rowie. Throughout the day we’ll have feedback sessions, presenting back to the room on progress. We’ll write blog posts, create videos, photograph progress. More workstream sessions with feedback and questions. 16:00 Show and Tell sessions – demonstrate to the room, and a wider audience, and preserve for posterity what you’ve produced in less than 36 hours. You’ll be amazed! Codethecity #6 – History Jam. Save the date, or grab yourself a ticket. Last October, we ran Code The City 5, a hack weekend focussing on history and heritage. One of the projects that we worked on was “Histerical Time Machine”. 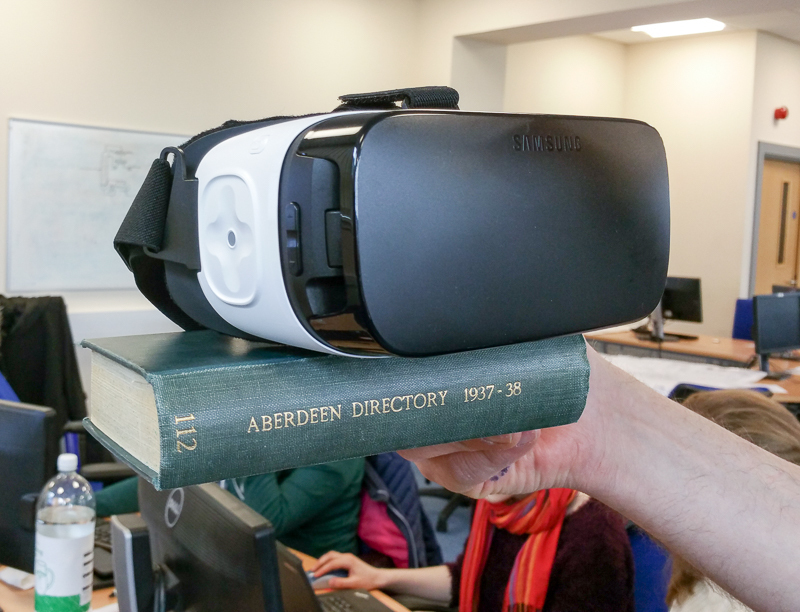 Over the course of 36 hours Andrew Sage built a 3D virtual reality model of a small section of the centre of Aberdeen as it was in the 1870s. Alongside this we saw a group of volunteers look at a variety of books (remember those!) and extract some key dates to attach to the model. Normally at Code The City events, participants are encouraged to come up with the ideas and are free to work on what they want. 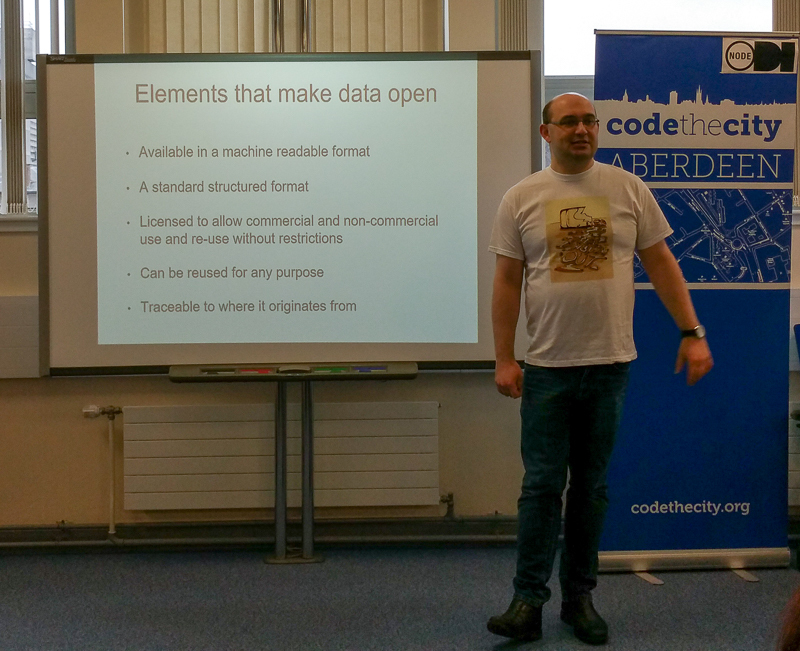 We are going to run Code The City 6 , which will be supported by Aberdeen City Libraries, slightly differently. We are all going to work on sub-projects that will contribute to the further development of the 3D Historical model, and its data needs. expanding the geographic coverage of the model. There will tutorials for developers on how to do that in Unity. transcribing a variety of pre-identified sources of data and putting those into structured formats that will drive not only this project but also be a permanent free source of open data. visualising data within the 3d model and in other ways. writing about the weekend, taking photos, blogging and using social media to tell the world what we are doing. If you come with enthusiasm we’ll find a role for you – and we guarantee you will leave having picked up new skills, and with a sense of having achieved something useful with lasting value. Bring a laptop to work on if you have one. An HDMI cable is useful for connecting to external monitors. If you want to take pictures or videos please take your own equipment if you can. We’ll make sure there is wifi for you to use. Don’t forget your power cable, and any chargers you might need too! What does the weekend look like? We’ll open up on Saturday morning at 9am, then have breakfast and a briefing session at 9.30am. We’ll then break into groups, each with a distinct set of tasks. During the day, each group will work on their projects and periodically report back to the room on progress. We’ll have lunch then continue in the same fashion for the afternoon. We’ll have pizza and drinks for tea and those who want to work on into the evening. On Sunday we’ll start at 10am with breakfast and a quick update. We’ll follow the same pattern as Saturday, with lunch. We’ll wind up with a grand show and tell session in the late afternoon. Then save the date, or grab yourself a ticket.